Marvel’s Agent Carter wrapped season two earlier this week on ABC, and the finale ended with a major cliffhanger. The series was not renewed for a third season with the large batch of shows renewed by ABC this week, but it could see a pick-up in May. Michele Fazekas, an executive producer on the series, spoke with The Hollywood Reporter about what fans might see if the series returns for a third season next year. The finale ended with Jack Thompson being shot and laying in a pool of his own blood. Fazekas revealed that he was only shot. He might still live, but fans will need to wait until next season to find out who the mystery person who shot him is! Fans might also see more of Dottie next season. That character is played by Bridget Regan, and she has two other shows she has commitments too. Are you a fan of Marvel’s Agent Carter? Do you want ABC to bring it back for a third season? Tell us what you think. 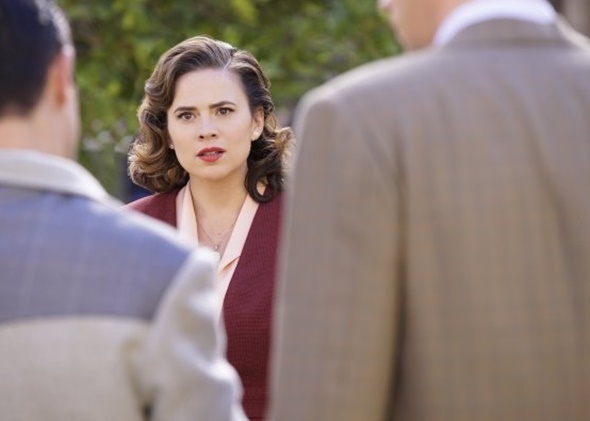 More about: Marvel's Agent Carter, Marvel's Agent Carter: canceled or renewed? Need to take her to the creation of Shield from SSR. At least this. Can be done as an AoS flashback or retro episode if necessary. I would vote for a return. If ratings are low they can move her to SHIELD and end the line….but there is still story there to be had. The period setting sells the show visually, the stories are actually pretty good. So, yeah I vote keep it.